November 22, 2014: It's been a busy month here on the mountain. The 1st deer is in the freezer but, as usual, the smart ones quickly become nocturnal when the shooting starts so hunting becomes a matter of waiting for "dummy" to show up. We do have "mama and the twins" visit us daily to pick at the turkey corn or whatever apple peelings we throw out, but she's been visiting us for so many years that she is like a family member and strictly off limits. I just finished a big woodworking project as a Christmas present for a daughter (photo coming soon), and I'm restocking the wood pile to replace the extra wood used during the recent cold snap. It is nice to keep our living space between 74 and 78 degrees with the only cost being gas and oil for the chainsaws and wood splitter with the added advantage of getting some daily exercise. With family coming for Thanksgiving next week, today's posting of our Word Stuff program with one bug fix and one enhancement will likely be the only DFF change this month. Both changes were triggered while using the program to help solve Mensa daily calendar puzzles. 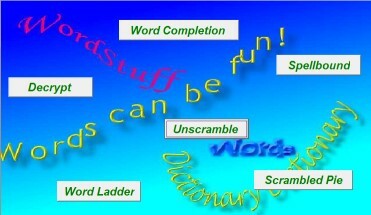 See Word Stuff #2 page for details. November 24, 2014: Our popular CutList program underwent a fairly major update a month or two ago. A minor bug caused zoomed cutting diagrams to display across multiple screens but without a scrollbar to allow access. CutList Version 4.02 posted today fixes the problem.